BetSoft’s 3D slots are some of the most innovative in the industry. Until recently, however, no US-friendly online casino has offered them to its players — but that’s now changed. Bovada.lv is the only online casino (that I am aware of, at least) that offers US players the chance to play the more than 35 BetSoft 3D Slots. You’ll find that these slots cover sports, fantasy, sci-fi, and so on. Many of them have clever story lines that will keep you interested in the game for longer than most. Here are the five newest BetSoft 3D Slots available at Bovada. Skeeter the farmer lived a nice and quiet life. This all changed one morning, as he discovered that he had been paid a visit from a mysterious extra-terrestrial plant – it came from Venus. Join him and his alien plant-friend in this brand new 3D Slot game, as they try to evade the army, whose mission it is to capture Skeeter’s newfound friend and dissect it. 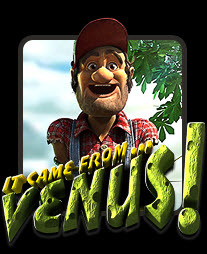 With Random Wilds, bonus rounds, free spins and a ton of other great features, your good deed of helping to protect this foreign plant will grant you great winnings. 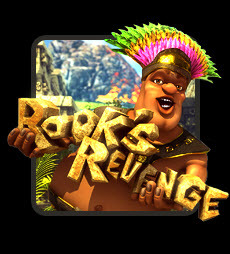 Rook, everyone’s favorite Aztec chief, is at it again in this incredible 5-reel, 25 line cascading reels 3D Slot game. Follow the path less traveled as you make your way into the heart of the rainforest in search of unbelievable riches. With Rook as your guide, find the hidden treasure vault in order to reap luxurious rewards. With exploding symbols, wilds and Golden Masks that trigger Free Spin bonus rounds, your journey into the rainforest will be nothing less than thrilling. 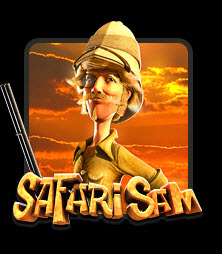 Pack your bags and get ready to journey into the wild as you join Safari Sam on his adventures into the unexplored wilderness. This exotic 5-Reel, 30 Line 3D Slot game offers you a glance at an impressive African landscape, with tons of opportunities to win big. Help Sam choose the best spot to watch the wild animals and you’ll enter the bonus round, giving you ample opportunities to increase your winnings. Chow down at the hottest sushi spot in town. 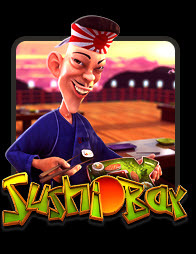 This 5-Reel, 25 Line 3D Slot game has world renowned chef, Haru, slicing and dicing the most delicious array of sushi, all for your pleasure. Whether you prefer Sashimi or Nigiri, you’re appetite is sure to grow as you watch the sushi he prepares spin across the Reels. Add a little soy sauce to your plate to amplify your winnings with the Soy Sauce Wild Multiplier feature. If the wasabi’s got you spiced up, three or more Fan symbols will get you a bunch of free spins, meaning more money in your pocket. Be sure to grab a seat at the bar with an empty stomach when you play Sushi Bar. Back in the 19th century, a brilliant young inventor named Mr. Miles Bellhouse invented a wondrously novel machine that allowed people to travel through time. Now you’ve got a chance to get a glimpse of time’s past when you join Miles and his trusted robot assistant Gizmo, as they travel through the years in this time-defying 5-Reel, 30 Line 3D Slot game. Be careful though, the nosy General Traytor has got his sights on Miles’ invention and will stop at nothing to steal it. 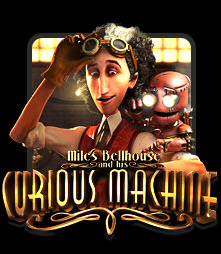 Brace yourself and hop aboard The Curious Machine – you’re in for the ride of your life. In addition to accepting players from all US states and most other countries, Bovada allows all of their players to play any of the games in practice mode. If you do decide to make a deposit, you might want to claim their 50% initial deposit bonus when you make a deposit between $20 and $500. This is Vegas is 3 years old!